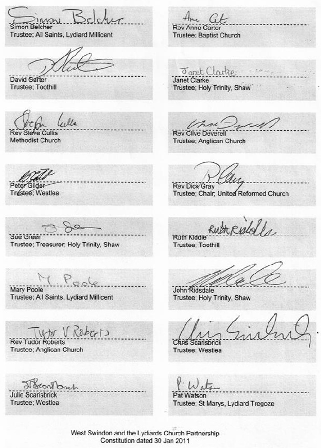 Signed by 5 Local Church representatives, 3 Staff Team, 4 Denominational representatives, and the Partnership Council (the Trustees). Most computers will open PDF files automatically, if yours does not, get Adobe Acrobat PDF reader to read and print some of the documents. Previously, churches that were members of certain denominations were exempt from charity registration (or were included in an overarching registration). Local Ecumenical Partnerships were a particularly confusing issue and poorly understood by the Charity Commission. Registration is now compulsory for us, and overdue. The main barrier to application is our Constitution, which the Charity Commission refer to as our Guidance Document. There is a standard text which we must adopt, with only very minor customisation by us. This standard text was defined (by Churches Together in England) after our 2009 constitution work was already done. The new document incorporates much of the learning we went through, but also includes some legal stuff which is new. Our old old Constitution dates from 6 Dec 1988.